Set in the splendor of the ancient Mayan culture, Gold of the Gods is the newest online video slot to hit WGS casinos. 5 reels, 25 paylines, a bonus feature that awards free spins, multipliers and coin and scatter pays are what is in store for those who enter this magnificent online slot. There are many symbols throughout the latest slot game that depict the glorious Mayans but the 2 symbols that players will look forward to landing in their reels are the wild and the scatter. The wild symbol is the High Priest adorned with a gold headdress. It will substitute for all symbols to create winning combinations except for the scatter symbol. If 5 wilds land in a payline the payout is a colossal 10,000 coins! The sacred Sceptre is the scatter symbol of the new slot machine. If 2 of these symbols appear anywhere in the reals, players will be award a scatter pay. If 3 or more land anywhere in the reels, players will be awarded the bonus round. The Eclipse bonus feature sets a solar eclipse into motion. Players will then be presented with stone tablets inscribed with an ancient artifact. Choose the correct tablets and one will win cash prizes, multipliers and/or free spins. If one chooses the sun symbol, the bonus round will end. The cash prizes and free spins are award at the close of the bonus round and are paid out at the multiplier amount if one was revealed. 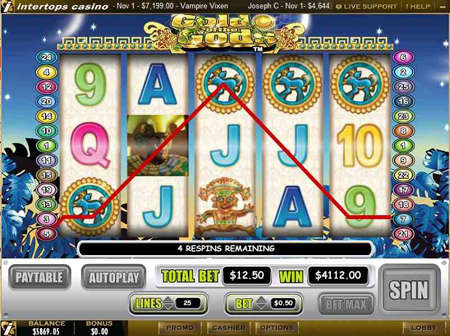 Gold of the Gods online slot has the potential to pay out immensely as the picture above shows. Play the new online game Gold of the Gods at your favorite WGS casino today.